Because I’m a geek, I track lots of stats about my physical state. I track the number of calories I consume, the number of calories I burn, the amount of exercise I do, and, yes, the amount of sleep I get. During the first few days of our vacation, I had nights of five hours, four hours, and zero hours of sleep. For a man who averages about 7-1/2 hours of sleep per night, that was not enough. Not even close. Fortunately, I woke better rested than on previous mornings, but I found myself in a bit of a funk. I was grouchy and out of sorts. I had a boil on my arm (which was gross and painful), I hadn’t been getting the exercise I was used to (yes, we were walking a lot, but at a slow pace), and I was just generally out of sorts. The Rick Steves group — which has a “no grumps” policy — met for a tour of the Accademia art gallery, where an Italian tour guide spent 90 minutes describing the collection of Catholic art. I hated it. Much of this art is beautiful, and I don’t have anything against Catholics, but it was all too much, too soon. After just a few days in Italy, I was beginning to believe the entire country was only about Catholicism. And wine. Note: Throughout Europe, there are thousands of bored docents and museum attendants, ostensibly watching the crowds (“no photo!”), but actually engrossed in their smartphones. After the Accademia, we toured Ca’ Rezzonico, a palazzo (or palace) that has been converted into a museum dedicated to 18th-century Venice. The building was grand, and I liked some of the art, but my feet were sore, the day was hot, the pace was slow, and I was cranky that this palazzo — which had been billed to us as “typical of the day” — was mostly unfurnished. (At the Louvre in Paris, I was pleased as punch that the Napoleon III rooms retained much of their original furnishings.) It didn’t take long until Kris was grumpy that I was grumpy. Fortunately, my mood improved in the afternoon. First, Joy and Phil — the only other couple our age in the tour group — invited us to join them for lunch. I was quiet and surly at first, but the food and conversation improved my mood. Plus, I shared a liter of wine with Joy and Phil. If you get to Venice, I recommend Avogaria Locanda, which is also apparently a hotel. The beef stew was great! Typical menu board in Italy. Note that “panini” just means “sandwiches”. After lunch, Kris and I meandered back to the hotel. This was fun for me because it meant I got to pick my way through the twisting maze of Venetian streets. Throughout the trip, I kept saying that maps and directions are one of my super powers. It’s true. I love going to a new city and having to navigate my way around. Venice was probably the most fun I’ve ever had doing this. We made a quick pit stop, and then headed out again. First we stopped so Kris could buy some Murano glass. Next, we walked over to the Basilica di San Giovanni e Paolo (or, the church of St. John and Paul). It’s tough to convey the scale of this place. It’s huge. Note the woman in lower left. Another member of our group (Carrie) had stumbled upon this church by accident, and told us it was great. She was right. Though San Giovanni e Paolo doesn’t get promoted in the guidebooks, it’s actually fairly cool. It was one of Kris’ favorite spots on our entire trip. “I like the tombs,” she says. She likes the tombs in all of the churches. And this church had the tomes of 25 doges (or dukes), the rulers of Venice. Note the floor, which is in a state of “elegant decay”. Kris likes this “dead baby angel” bas relief. She likes all tombs. 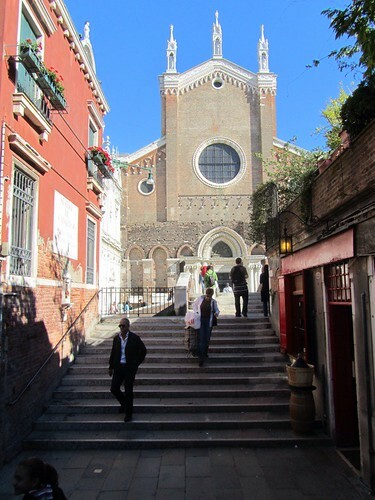 After San Giovanni e Paolo, we decided to hoof it to St. Mark’s before it closed. I got side-tracked, however, by a bookstore billing itself (in self-conscious irony) as “the most beautiful bookshop in the world”, which is technically called Libreria Acqua Alta. This bookstore is far from beautiful, but the owner is friendly, and happy to crack jokes in English (and other languages, too, I suspect). The store features stacks and stacks of used books, all tumbling over each other in wonderful disarray. I spent a happy half hour digging through old comics before buying some Italian translations of comics I loved as a kid. “I hate tourists,” this cat seems to be saying. He did not want his photo taken. 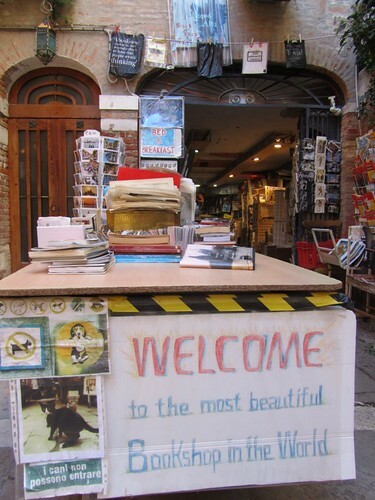 If you’re a book lover, this is a must-visit destination in Venice. Damn Rick Steve for not including this in his guidebook! Despite the side-trip, we were able to see St. Mark’s — for five minutes. Because we had a museum pass from earlier in the day, we were able to get into the ground floor for free. We followed the masses around and snapped a couple of quick photos. If we’d had more time, we could have paid to see the famous four horses. Based on our cursory visit, though, we weren’t impressed. It’s neat, but it’s very touristy. The Scrovegni Chapel in Padua was better, and maybe too were the other cathedrals we saw in Venice. We returned to the hotel, where we spent some time unwinding. Then we headed out to dinner with new friends Joy and Phil. We ate at a place that had been recommended to them by friends: Osteria Antico Giardinetto. It’s a lovely, quiet little spot with good food and friendly staff. Phil’s meal was squid-ink pasta. This isn’t a bad photo — the stuff is just black! Back at the hotel, we packed for our morning departure to Florence. Florence is my dream vacation destination. Can’t wait to see your write up! Thanks for doing such great write-ups of your trip, JD. I too look forward to the next installments. I have had my cranky moments on trips, also. When it happens I repeat the mantra, “I will be this way but once” to myself. In and of itself it doesn’t make the crankiness go away but it does help me quit focusing on myself and focus on what I am experiencing until the crankiness goes away. My first day in Italy was much the same as yours. Except longer. We went clubbing and didn’t make it back to our hotel until after 800. And were then up and off by 1100 to do it all again. I was so in awe of what I was experiencing and had so much adrenalin running through me that sleep just didn’t seem necessary. It all caught up with me by our 9th or 10th day and I spent most of one day in Milan sleeping. P.S. Had you paid to see the “famous four horsemen” you would have discovered that there are no men. It is simply four horses. Oops. You’re right, Nicholas. I’ve fixed my equine error. J.D., knowing your love of books, and bookstores, I’m glad you found ” the most beautiful bookstore in the world”. I would have gone inside also, and bought a few postcards. Kris, if there is a fire, I guess one jumps into the canal and swims. Right? Funny. Oh, these are great fun to read. I’m looking forward to the next installments – it’s nice that you’re taking some time with them! I’ve only been to Europe once and it took me days to get a regular night’s sleep. It felt so great to finally acclimate.